It stitched out beautifully. Place it on 12 washcloths to be given in children's treat bags. Also place onto organza with a stabilizer for applying to my grand-daughters baretts. Enlarged and embroidered 3 onto a bath towel and reduced size for a created beach towel for American girl doll. My grand-daughter was so happy because it looked like those popular icons. Stitched out perfectly on the front of a sweatshirt - always love your designs.....just need to find time to stitch more of them out :) !! 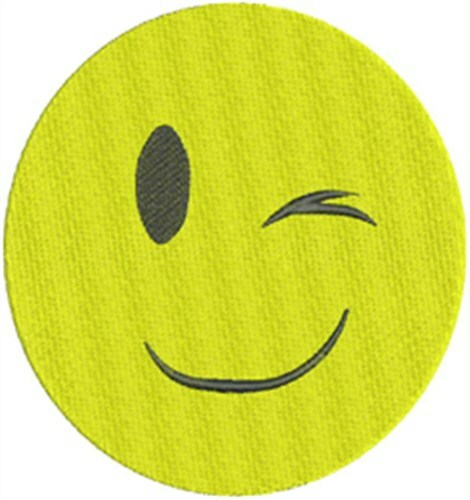 Fireside Threads is happy to present Winking Smiley Face machine embroidery design which has 3592 stitches and is [51.05 mm x 50.80 mm] large. If you would like to view more embroidery patterns please search on our embroidery designs page.